Do you want to save water, save energy, help reduce carbon impact on the environment and save money? ​Pacific Tankless has a solution. 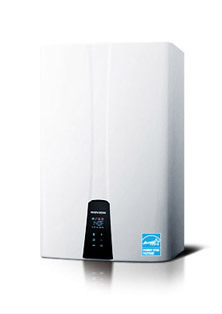 Modern tankless water heaters have very high energy efficiency factor, up to 0.97- almost no energy is wasted heating water. Unlike regular water heaters which heat the water in their tanks 24/7 and almost half of the heating energy is lost, tankless water heaters work on demand only. Tankless water heaters will heat water only when you need hot water- this will reduce your energy demand (electricity, NG or LP) and your personal carbon footprint. When we turn a shower on, often times we have to wait for the hot water to arrive. In some homes, depending on architectural characteristics, pipes, water heater and bathroom location, this waiting period could be four minutes or even longer. Typical shower head water flow is around 2 gallons per minute (gpm). While waiting four minutes for hot water, in an year a household of four unintentionally will waste some 14,600 gl of clean, potable water down the drain. Hot water recirculation system will significantly reduce the waiting time and thus water waste. Tankless water heaters with a built-in recirculating pump, hot water return lines and efficiently designed water piping are solutions to a major problem which can not be ignored. Most of our work takes place in residential environment- attached and detached homes. Some of our clients are also property managers, investors, and business owners. We have completed projects in a number of restaurants, beauty salons, spa, a flower shop, car wash, hotels, office buildings, churches, medical and dental facilities. ​Over 2,000 completed projects. ​Serviz, and other major plumbing companies.